January is usually the month which marks new beginnings; ‘out with the old, and in with the new’, which is why we were so happy to give one lucky customer a £15 Amazon Gift Card to start their 2014 in style! 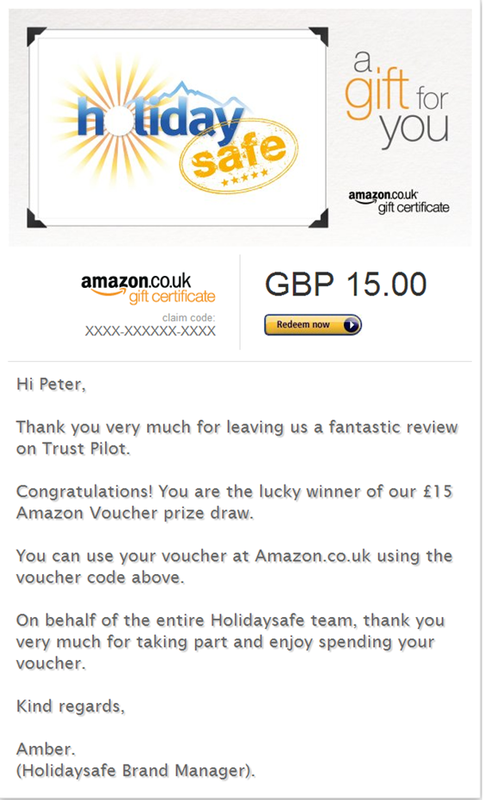 As a thank you to all the lovely customers who take time out of their busy days to leave us reviews on our Trust Pilot page, we started a monthly prize draw, where we randomly choose the name of one reviewer and send them an Amazon gift card worth £15. 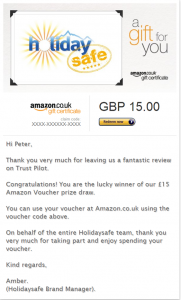 If you would like to receive a £15 Amazon Voucher then you’re in luck, because every single month Holidaysafe offer one lucky customer the chance to win! To be entered into the prize draw, all you need to do is leave us a quick review about our customer service, website or policies on our Trust Pilot Evaluation page, and your name will automatically be added to the prize draw.